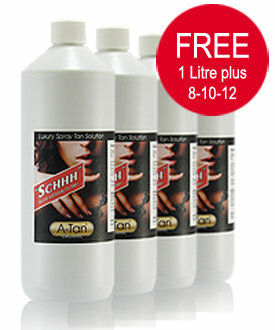 The A-Tan 4 for 3 "all shades" offer includes 8% (Fair), 10% (Medium) and 12% (Dark) .... and a fourth bottle FREE! That's approximately £300 of extra business if you charge £15 per tan and get 20 tans per litre. Hurry ... offer only while stocks last! This 4 litre offer also includes FREE delivery to mainland UK addresses. Simply tell us which shade you prefer (your 1 litre free bottle) in comments on checkout page. Happy tanning!